The American Revolutionary War (1775–1783), also known as the American War of Independence, was the military component of the American Revolution. It was fought primarily between Great Britain and revolutionaries within the 13 British colonies in North America who declared their independence with the Declaration of Independence as the United States of America early in the war. The war began largely as a colonial revolt against the mercantile and economic policies of the British Empire, and eventually widened far beyond British North America, with France, Spain, and the Netherlands entering the war against Great Britain. Additionally, many Native Americans in the United States fought on both sides of the conflict. Throughout the war, the British were able to use their naval superiority to capture and occupy coastal cities, but control of the countryside and most of the population largely eluded them. French involvement proved decisive, with a naval battle for control of Chesapeake Bay leading to the surrender of a British army at the Battle of Yorktown, Virginia in 1781. The Treaty of Paris in 1783 recognized the independence of the United States. The terms American Revolutionary War and American Revolution are often used interchangeably, though the American Revolution included political and social developments before and after the war itself. The republic that emerged from the war was a new type of nation, based not on race, nationality, on a common culture or religion but on shared values and on loyalty to ideals enshrined in its founding documents. The object of the war was to make a fresh start. The new republic would reject many of the attitudes and beliefs that, in its founders' view, caused war and conflict in the Europe they had left behind. On the one hand, such principles as the right to "life, liberty and to the pursuit of happiness" as well as the phrase "all men are created free" would at first be applied selectively, not to all who lived in the new republic. It would take many years before women, American Indians, blacks and other minorities would enjoy all the rights of citizenship. On the other hand, the principles of liberty, individual rights, equality and hostility toward corruption were genuinely part of the psychology of the nation, so the struggle to realize these more fully was also a struggle for the nation to honor its own core values. Time would see the reality resemble the ideal much more closely. What began as a military struggle would become that of a nation struggling with its own soul to live up to its deepest aspirations and ideals. Colonists were divided over which side to support in the war; in some areas, the struggle was a civil war. The Revolutionaries (also known as Americans or Patriots) had the support of about 40 to 45 percent of the colonial population. About 15 to 20 percent of the population supported the British Crown during the war, and were known as Loyalists (or Tories). Loyalists fielded perhaps 50,000 men during the war years in support of the British Empire. After the war, some 70,000 Loyalists departed the United States, most going to Canada, Great Britain, or to British colonies in the Caribbean. When the war began, the Americans did not have a professional army (also known as a "standing army"). Each colony had traditionally provided for its own defenses through the use of local militia. Militiamen served for only a few weeks or months at a time, were generally reluctant to go very far from home, and would often come and go as they saw fit. Militia typically lacked the training and discipline of regular troops, but could be effective when an emergency energized them. Seeking to coordinate military efforts, the Continental Congress established (on paper) a regular army—the Continental Army—in June 1775, and appointed George Washington as commander-in-chief. 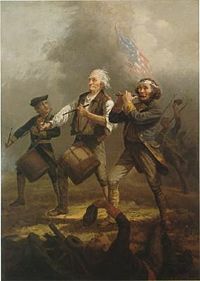 The development of the Continental Army was always a work in progress, and Washington reluctantly augmented the regular troops with militia throughout the war. Although as many as 250,000 men may have served as regulars or as militiamen for the Revolutionary cause in the eight years of the war, there were never more than 90,000 total men under arms for the Americans in any given year. Armies in North America were small by European standards of the era; the greatest number of men that Washington personally commanded in the field at any one time was fewer than 17,000. Early in 1775, the British army consisted of about 36,000 men worldwide, but wartime recruitment steadily increased this number. Additionally, over the course of the war the British hired about 30,000 German mercenaries, popularly known in the colonies as "Hessians" because many of them came from Hesse-Kassel. Germans would make up about one-third of the British troop strength in North America. By 1779, the number of British and German troops stationed in North America was over 60,000, though these were spread from Canada to Florida. France, the Netherlands and Spain entered the war against Great Britain in an attempt to dilute Britain's emerging superpower status. Early on, all three countries quietly provided financial assistance to the American rebels. France officially entered the war in 1778 and soon sent troops, ships, and military equipment to fight against the British for the remainder of the war. Spain entered the war in 1779, officially as an ally of France but not the United States—Spain was not keen on encouraging similar rebellions in her own empire. The Netherlands entered the war late in 1780, but was soon overwhelmed by the British. African-Americans, slaves and free blacks, served on both sides during the war. Black soldiers served in northern militias from the outset, but this was forbidden in the South, where slave owners feared arming slaves. Lord Dunmore, the Royal Governor of Virginia, issued an emancipation proclamation in November 1775, promising freedom to runaway slaves who fought for the British; General Sir Henry Clinton issued a similar edict in New York in 1779. Tens of thousands of slaves escaped to the British lines, although possibly as few as 1,000 served under arms. Many of the rest served as orderlies, mechanics, laborers, servants, scouts and guides, although more than half died in smallpox epidemics that swept the British forces, and a number were driven out of the British lines when food ran low. Despite Dunmore's promises, the majority were not given their freedom. Due to manpower shortages, Washington lifted the ban on black enlistment in the Continental Army in January 1776. All-black units were formed in Rhode Island and Massachusetts; many were slaves promised freedom for serving in lieu of their masters. Another all-black unit came from Haiti with French forces. At least 5,000 black soldiers fought for the Revolutionary cause. Most American Indians east of the Mississippi River were affected by the war, with many communities dividing over the question of how to respond to the conflict. Most Native Americans who joined the fight fought against the United States, since native lands were threatened by expanding American settlement. An estimated 13,000 warriors fought on the British side; the largest group, the Iroquois Confederacy, fielded about 1,500 warriors against the Americans. Before the war, Boston, Massachusetts had been the scene of much revolutionary activity, leading to the effective abolition of the provincial government of Massachusetts by the British parliament in 1774. However, popular resistance to these measures compelled the newly appointed royal officials in Massachusetts to resign or to seek refuge in Boston. Lieutenant General Thomas Gage, the British Commander-in-Chief, North America, commanded four regiments of British regulars (about 4,000 men) from his headquarters in Boston, but the countryside was in the hands of the Revolutionaries. The militiamen then converged on Boston, bottling up the British in the city. About 4,500 more British soldiers arrived by sea, and the British then attempted to break the siege. On June 17, 1775, British forces under General 5th Viscount William Howe seized the Charleston peninsula at the Battle of Bunker Hill. The Americans fell back, but British losses were so heavy that the attack was not followed up. The siege was not broken, and General Gage was soon replaced by General Howe as the British commander-in-chief. In July 1775, newly appointed General Washington arrived outside Boston to take charge of the colonial forces and organize the Continental Army. The standoff continued throughout the fall and winter. In early March 1776, heavy cannons that had been captured at Fort Ticonderoga were placed on Dorchester Heights, overlooking the British positions. Howe's situation was now untenable, and the British evacuated the city on March 17, 1776, sailing for temporary refuge in Halifax, Nova Scotia. Washington then took most of the Continental Army to fortify New York City. During the long standoff at Boston, the Continental Congress sought a way to seize the initiative elsewhere. Congress had initially invited the French Canadians to join them as the fourteenth colony, but when that failed to happen, an invasion of Canada was authorized. The goal was to remove British rule from the primarily francophone province of Quebec (comprising present-day Quebec and Ontario). Two expeditions were undertaken. On September 16, 1775, Brigadier General Richard Montgomery marched north from Fort Ticonderoga with about 1,700 militiamen, capturing Montreal on November 13. General Guy Carleton, the governor of Canada, escaped to Quebec City. The second expedition, led by Colonel Benedict Arnold, was a logistical nightmare, with many men succumbing to smallpox. By the time Arnold reached Quebec City in early November, he had but 600 of his original 1,100 men. Montgomery's force joined Arnold's, and they attacked Quebec City on December 31, but were soundly defeated by Carleton. The remaining Americans held on outside Quebec City until the spring of 1776, and then withdrew. Another attempt was made by the Americans to push back towards Quebec, but failed at Trois-Rivières on June 8, 1776. Carleton then launched his own invasion, and defeated Arnold at the Battle of Valcour Island in October. Arnold fell back to Fort Ticonderoga, where the invasion of Canada had begun. The invasion of Canada ended as a disaster for the Americans, but Arnold's improvised navy on Lake Champlain had the effect of delaying a full-scale British counteroffensive until the Saratoga campaign of 1777. Having withdrawn from Boston, the British now focused on capturing New York City. To defend the city, General Washington divided his 20,000 soldiers between Long Island and Manhattan. (While British troops were assembling on Staten Island for the campaign, Washington had the newly issued Declaration of American Independence read to his men.) On August 27, 1776, after landing about 22,000 men on Long Island, the British drove the Americans back to Brooklyn Heights. General Howe then laid siege to fortifications there, but Washington managed to evacuate his army to Manhattan. On September 15, Howe landed about 12,000 men on lower Manhattan, quickly taking control of New York City. The Americans withdrew to Harlem Heights, where they skirmished the next day, but held their ground. When Howe moved to encircle Washington's army in October, the Americans again fell back, and a battle at White Plains was fought on October 28, 1776. Once more Washington retreated, and Howe returned to Manhattan and captured Fort Washington in mid-November, taking almost 3,000 prisoners. Emanuel Leutze's 1851 painting Washington Crossing the Delaware is an iconic image of American history. General Lord Cornwallis continued to chase Washington's army through New Jersey, until the Americans withdrew across the Delaware River into Pennsylvania in early December. With the campaign at an apparent conclusion for the season, the British entered winter quarters. Although Howe had missed several opportunities to crush the diminishing rebel army, he had killed or captured over 5,000 Americans. He controlled much of New York and New Jersey, and was in a good position to resume operations in the spring, with the rebel capital of Philadelphia in striking distance. The outlook of the Continental Army was bleak. "These are the times that try men's souls," wrote Thomas Paine, who was with the army on the retreat. The army had dwindled to fewer than 5,000 men fit for duty, and would be reduced to 1,400 after enlistments expired at the end of the year. Congress had abandoned Philadelphia in despair, although popular resistance to British occupation was growing in the countryside. 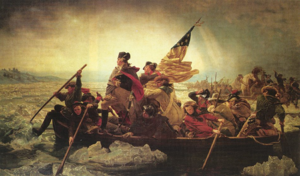 Washington decided to take the offensive, stealthily crossing the Delaware River on Christmas night and capturing nearly 1,000 Hessians at the Battle of Trenton on December 26, 1776. Cornwallis marched to retake Trenton, but was outmaneuvered by Washington, who successfully attacked the British rearguard at Princeton on January 3, 1777. Washington then entered winter quarters at Morristown, New Jersey, having given a morale boost to the American cause that surged enlistments and swelled the Continental Army's ranks. New Jersey militia continued to harass British and Hessian forces throughout the winter. When the British began to plan operations for 1777, they had two main armies in North America: Carleton's army in Canada, and Howe's army in New York. In London, Lord George Germain approved campaigns for these armies which, because of miscommunication, poor planning, and rivalries between commanders, did not work in conjunction. The result was the disastrous surrender of the northern army at Saratoga. The first of these campaigns was an expedition from Canada led by General John Burgoyne. 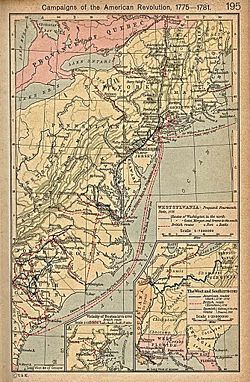 The goal was to seize the Lake Champlain and Hudson River corridor, effectively isolating New England from the rest of the American colonies. Burgoyne's invasion had two components: he would lead about 10,000 men along Lake Champlain towards Albany, New York, while a second column of about 2,000 men, led by Barry St. Leger, would move down the Mohawk River valley and link up with Burgoyne in Albany. 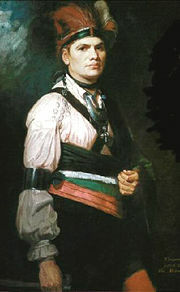 The Mohawk leader Joseph Brant commanded both American Indians and white Loyalists during the American Revolutionary War. Burgoyne set off in early July, recapturing Fort Ticonderoga without firing a shot. His march was slowed by the Americans, who destroyed bridges and felled trees in his path. A detachment was sent out to seize supplies, but was decisively defeated by American militia in August, depriving Burgoyne of nearly 1,000 men and the much-needed supplies. Meanwhile, St. Leger—half of his force American Indians led by Joseph Brant—had laid siege to Fort Stanwix. American militiamen and their Indian allies marched to relieve the siege, but were ambushed and scattered at the Battle of Oriskany on August 6. When a second relief expedition approached, this time led by Benedict Arnold, the siege was lifted, and St. Leger's expedition returned to Canada. Burgoyne pushed on towards Albany, his forces now reduced to about 6,000 men. An American army of 8,000 men, commanded by the General Horatio Gates, had entrenched about 10 miles (16 km) south of Saratoga, New York. Burgoyne tried to outflank the Americans, but was checked at the first battle of Saratoga on September 19, 1777. Burgoyne was in trouble now, but he hoped that help from Howe's army in New York City might be on the way. It was not: Howe had instead sailed away on an expedition to capture Philadelphia. American militiamen, many of them outraged by the reported murder of an American woman at the hands of Burgoyne's Indian allies, flocked to Gates's army, swelling his force to 11,000 by the beginning of October. Burgoyne, his position becoming desperate, launched the second battle of Saratoga on October 7. Badly beaten, Burgoyne surrendered on October 17. Saratoga is often regarded as the turning point of the war. Revolutionary confidence and determination, suffering from Howe's successful occupation of Philadelphia, was renewed. Even more importantly, the victory encouraged France to enter the war against Great Britain. Spain and the Netherlands soon did the same. For the British, the war had now become much more complicated. Meanwhile, having secured New York City in 1776, in 1777 General Howe concentrated on capturing Philadelphia, the seat of the Revolutionary government. He moved slowly, landing 15,000 troops in late August at the northern end of Chesapeake Bay. Washington positioned his 11,000 men between Howe and Philadelphia, but was driven back at the Battle of Brandywine on September 11, 1777. The Continental Congress once again abandoned Philadelphia, and on September 26, Howe finally outmaneuvered Washington and marched into the city unopposed. Washington unsuccessfully attacked the British encampment in nearby Germantown in early October, and then retreated to watch and wait. Washington and his army encamped at Valley Forge in December 1777, about 20 miles (32 km) from Philadelphia, where they would stay for the next six months. Over the winter, 2,500 men (out of 10,000) died from disease and exposure. The next spring, however, the army emerged from Valley Forge in good order, thanks in great part to a training program instituted and supervised by Prussian general and Seven Years War veteran Friedrich Wilhelm von Steuben. Meanwhile, there was a shakeup in the British command, with General Clinton replacing Howe as commander-in-chief. French entry into the war had changed British strategy, and Clinton was ordered to abandon Philadelphia and defend New York City, now vulnerable to French naval power. Washington's army shadowed Clinton on his withdrawal, and forced a battle at Monmouth on June 28, 1778, the last major battle in the north. Clinton's army escaped to New York City, and Washington returned to White Plains: both armies were back where they had been two years earlier. With the exception of scattered minor actions in the north, like the Battle of Stony Point, the focus of the war now shifted elsewhere. George Rogers Clark's 180 mile (290 km) trek in the dead of winter led to the capture of General Henry Hamilton, Lieutenant-Governor of Canada. West of the Appalachian Mountains, the American Revolutionary War was an "Indian War." The British and the Continental Congress both courted American Indians as allies (or urged them to remain neutral), and many Native American communities became divided over what path to take. Like the Iroquois Confederacy, tribes such as the Cherokees and the Shawnees split into factions. Delawares under White Eyes signed the first American Indian treaty with the United States, but other Delawares joined the British. The British supplied their Indian allies from forts along the Great Lakes, and tribesmen staged raids on Revolutionary settlements in New York, Kentucky, Pennsylvania and elsewhere. Joint Iroquois-Loyalist attacks in the Wyoming Valley and at Cherry Valley in 1778 helped provoke the scorched earth Sullivan Expedition into western New York during the summer of 1779. On the western front, every man, woman, and child—regardless of race—was a potential casualty. In the Ohio Country, the Virginia frontiersman George Rogers Clark attempted to neutralize British influence among the Ohio tribes by capturing the outposts of Kaskaskia and Vincennes in the summer of 1778. When Gen. Henry Hamilton, the British commander at Detroit, retook Vincennes, Clark returned in a surprise march in February 1779 and captured Hamilton himself. However, a decisive victory in the West eluded the United States even as their fortunes had risen in the East. The low point on the frontier came in 1782 with the Gnadenhutten massacre, when Pennsylvania militiamen—unable to track down enemy warriors—executed nearly 100 Christian Delaware noncombatants, mostly women and children. Later that year, in the last major encounter of the war, a party of Kentuckians was soundly defeated by a superior force of British regulars and Native Americans. During the first three years of the American Revolutionary War, the primary military encounters were in the north. After French entry into the war, the British turned their attention to the southern colonies, where they hoped to regain control by recruiting thousands of Loyalists. A southern strategy also had the advantage of keeping the Royal Navy closer to the Caribbean, where the British needed to defend their possessions against the French and Spanish. On December 29, 1778, an expeditionary corps from General Henry Clinton's army in New York captured Savannah, Georgia. An attempt by French and American forces to retake Savannah failed on October 9, 1779. Clinton then besieged Charleston, capturing it on May 12, 1780. With relatively few casualties, General Clinton had seized the South's biggest city and seaport, paving the way for what seemed like certain conquest of the South. 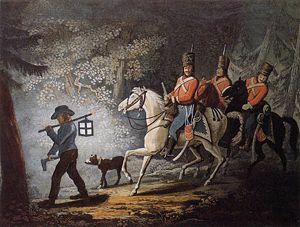 The remnants of the southern Continental Army began to withdraw to North Carolina, but were pursued by Colonel Banastre Tarleton, who defeated them at the Waxhaws on May 29, 1780. A story spread that Tarleton had massacred many Americans after they had surrendered. “Bloody Tarleton” became a hated name, and “Tarleton’s quarter” – referring to his reputed lack of mercy (or “quarter”)—soon became a rallying cry. With these events, organized American military activity in the region collapsed, though the war was carried on by partisans such as Francis Marion. Cornwallis took over British operations, while General Horatio Gates arrived to command the American effort. On August 16, 1780, Gates suffered one of the worst defeats in United States military history at the Battle of Camden, setting the stage for Cornwallis to invade North Carolina. The tables turned quickly on Cornwallis, however. One entire group of his army was utterly defeated at the Battle of Kings Mountain on October 7, 1780. Kings Mountain was noteworthy because it was not a battle between British redcoats and colonial troops: it was a battle between Loyalist and Patriot militia. Tarleton’s troops were subsequently defeated at the Battle of Cowpens on January 17, 1781 by American General Daniel Morgan. General Nathanael Greene, Gates's replacement, proceeded to wear down the British in a series of battles, each of them tactically a victory for the British, but giving no strategic advantage to the victors. Greene summed up his approach in a motto that would become famous: "We fight, get beat, rise, and fight again." Unable to capture or destroy Greene's army, Cornwallis moved north to to Virginia. In March 1781, General Washington dispatched General Lafayette to defend Virginia. The young Frenchman skirmished with Cornwallis, avoiding a decisive battle while gathering reinforcements. "The boy cannot escape me," Cornwallis is supposed to have said. However, Cornwallis was unable to trap Lafayette, and so he moved his forces to Yorktown, Virginia in July in order to link up with the British navy. Meanwhile the co-operation of the French became active. In July Count Rochambeau arrived at Newport, Rhode Island. That place had been occupied by the British from 1776 to the close of 1779. An unsuccessful attempt was made to drive them out in 1778 by the Revolutionaries assisted by the French admiral d'Estaing and a French corps. After Spain declared war against Great Britain in June of 1779, Count Bernardo de Gálvez, the Spanish governor of Louisiana, seized three British Mississippi River outposts: Manchac, Baton Rouge, and Natchez. Gálvez then captured Mobile on March 14, 1780, and, in May of 1781, forced the surrender of the British outpost at Pensacola, Florida. On May 8, 1782, Gálvez captured the British naval base at New Providence in the Bahamas. Galvez also supplied soldiers to George Rogers Clark and had been supplying substantial quantities of war supplies to the American rebels from as early as 1777. The Battle of the Saintes took place in 1782, during the American War of Independence, and was a victory of a British fleet under Admiral Sir George Rodney over a French fleet under the Comte de Grasse. The defeat dashed the hopes of France and Spain to take Jamaica and other colonies from the British. The Franco-British war spilled over into India in 1780, in the form of the Second Anglo-Mysore War. The two chief combatants were Tipu Sultan, ruler of the Kingdom of Mysore and a key French ally, and the British government of Madras. The Anglo-Mysore conflict was bloody but inconclusive, and ended in a draw at the Treaty of Mangalore in 1784. Also in 1780, the British struck against the United Provinces of the Netherlands in the Fourth Anglo-Dutch War to preempt Dutch involvement in the League of Armed Neutrality, directed primarily against the British Navy during the war. Agitation by Dutch radicals and a friendly attitude towards the United States by the Dutch government, both influenced by the American Revolution, also encouraged the British to attack. The war lasted into 1784 and was disastrous to the Dutch mercantile economy. On February 5, 1782, Spanish and French forces captured Minorca, which had been under British control since the Treaty of Utrecht in 1713. A further Franco-Spanish effort to recover Gibraltar was unsuccessful. Minorca was ceded to Spain in the peace treaty. An interesting footnote to this war was the actual landing on Britain itself of a ship from the U.S. Navy. This occurred in 1778 when the port of Whitehaven in Cumberland was raided by John Paul Jones. The landing was a surprise attack, taken as an action of revenge by Jones, and was never intended as an invasion. Nevertheless, it caused hysteria in England, with the attack showing a weakness that could be exploited by other states such as France or Spain. The northern, southern, and naval theaters of the war converged at Yorktown in 1781. On September 5, 1781, French naval forces defeated the British Royal Navy at the Battle of the Chesapeake, cutting off General Charles Cornwallis's supplies and transport. Washington hurriedly moved his troops from New York, and a combined Franco-American force of 17,000 troops commenced the Battle of Yorktown on October 6, 1781. Cornwallis's position quickly became untenable, and on October 19 his army surrendered. The war was all but over. Surrender of Cornwallis at Yorktown (John Trumbull, 1797). On the right is the American flag, on the left is the French flag (white flag of the monarchy). Despite the painting's title, Cornwallis (claiming illness) was not present and is not depicted. Washington is on horseback in the right background; because the British commander was absent, military protocol dictated that Washington have a subordinate—in this case Maj. Gen. Benjamin Lincoln—accept the surrender. British Prime Minister Lord North resigned soon after hearing the news from Yorktown. In April 1782, the British House of Commons voted to end the war in America. On November 30, 1782 preliminary peace articles were signed in Paris; the formal end of the war did not occur until the Treaty of Paris was signed on September 3, 1783 and the United States Congress ratified the treaty on January 14, 1784. The last British troops left New York City on November 25, 1783. The reasons for Great Britain's misfortunes and defeat may be summarized as follows: Misconception by the home government of the temper and reserve strength of her colonists; disbelief at the outset in the probability of a protracted struggle covering the immense territory in America; consequent failure of the British to use their more efficient military strength effectively; the safe and Fabian generalship of Washington; and perhaps most significantly, the French alliance and European combinations by which at the close of the conflict left Great Britain without a friend or ally on the continent. Decisive victory eluded the United States on the western frontier. Great Britain negotiated the Paris peace treaty without consulting her Indian allies, however, and ceded much American Indian territory to the United States. Full of resentment, Native Americans reluctantly confirmed these land cessions with the United States in a series of treaties, but the result was essentially an armed truce—the fighting would be renewed in conflicts along the frontier, the largest being the Northwest Indian War. The total loss of life resulting from the American Revolutionary War is unknown. As was typical in the wars of the era, disease claimed more lives than battle. The war took place in the context of a massive smallpox epidemic in North America that probably killed more than 130,000 people. Historian Joseph J. Ellis suggests that Washington's decision to have his troops inoculated may have been the commander-in-chief's most important strategic decision. Casualty figures for the American Revolutionaries have varied over the years; a recent scholarly estimate lists 6,824 killed and 8,445 wounded in action. The number of Revolutionary troop deaths from disease and other non-combat causes is estimated at about 18,500. Approximately 1,200 Germans were killed in action and 6,354 died from illness or accident. About 16,000 of the remaining German troops returned home, but roughly 5,500 remained in the United States after the war for various reasons, many becoming American citizens. No reliable statistics exist for the number of casualties among other groups, including American Loyalists, British regulars, American Indians, French and Spanish troops, and civilians. ↑ number of Loyalist troops: Mark Mayo Boatner, III. Encyclopedia of the American Revolution. (New York: McKay,  revised 1974. OCLC: 426061), 264. ↑ Number of Germans hired: Boatner, 424-426. ↑ Joseph J. Ellis. His Excellency: George Washington. (New York: Knopf, 2004), 87. Boatner, Mark Mayo, III. Encyclopedia of the American Revolution. New York: McKay,  revised 1974. ISBN 0811705781. Chambers, John Whiteclay II, (ed. in chief.) The Oxford Companion to American Military History. Oxford: Oxford University Press, 1999. ISBN 0195071980. Greene, Jack P. and J. R. Pole, (eds.) The Blackwell Encyclopedia of the American Revolution. Malden, MA: Blackwell,  reprint 1999. ISBN 1557865477. Kaplan, Sidney, and Emma Nogrady Kaplan. The Black Presence in the Era of the American Revolution. Amherst, MA: The University of Massachusetts Press, 1989. ISBN 0870236636. Fischer, David Hackett. Washington's Crossing (Pivotal Moments in American History) Oxford Univ. Press, 2004. ISBN 0195306767 Pulitzer prize-winning narrative of 1776-1777. History of "American Revolutionary War"
This page was last modified on 17 November 2016, at 16:14.